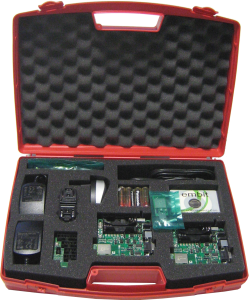 The evaluation/development kit EMB-Z2538PA-EVK is now available and provides all the tools (evaluation boards, programmer, sniffer for over-the-air traffic) to start your development on Embit latest CC2538-based platform: the EMB-Z2538PA. Such Embit CC2538-based platform provides 512 kB of FLASH memory and an amazing quantity of SRAM (32 kB). These features allow the customer to embed large and innovative wireless applications directly on the module (e.g., ZigBee Smart Energy compliant solutions). In particular, Internet Of Things (IoT) applications are a perfect fit for this module! With the development kit you get all the tools and documentation required to get started with your own firmware development; all you need to have is a computer with USB ports to connect the evaluation boards and the programmer! Finally, if you are not willing to develop your own firmware for the modules, you can just use the EBI-802.15.4 pre-programmed firmware that comes on the modules to build your own wireless sensor network in few minutes, using the EMB-Z2538PA modules as flexible UART modems.